The dustup between Office of Hawaiian Affairs CEO Kamana'opono Crabbe and his bosses, the OHA board of trustees, has caused a mighty ruckus in the Hawaiian community since May 9. But it's still unclear what impact Crabbe's "unauthorized" letter to Secretary of State John Kerry seeking an opinion on the legal status of the Hawaiian Kingdom will have on OHA's support for a campaign that aims to conduct formal nation-building through the Native Hawaiian Roll Commission. "As far as I'm concerned, this is just an internal OHA blip," said former Gov. John Waihee, chairman of the Native Hawaiian Roll Commission. Waihee said that there are more than 125,000 Native Hawaiians enrolled in the commission's Kana'iolowalu project, representing nearly 70 percent of Hawaiian adults. These Hawaiians, he said, are ready to vote for delegates, holde a convention later this year, and decide what kind of Hawaiian nation they want to create moving forward. But Crabbe, in sending his letter, said he would seek to delay the creation of a Native Hawaiian governing entity "until we can confirm that the Hawaiian Kingdom, as an independent sovereign state, does not continue to exist under international law and that we, as individuals, have not incurred any criminal liability in this pursuit." The trustees promptly rescinded the letter, saying it does not reflect board policy, and trustee Chairwoman Colette Machado said later that the letter appeared to undermine the trustees' $3.9 million commitment to the Kana'lolowalu process. Meanwhile, Crabbe found additional support during OHA's regular board of trustees meetings Wednesday and Thursday. The controversy dominated the open testimony portion of the meetings on Maui and Crabbe's actions were praised by many who attended. In addition, more than 2,400 people have signed an online petition supporting Crabbe. Among other things, the petition says Crabbe's inquiry to Kerry deserves a response and should be looked at critically before proceeding with any further nation-building effort. The trustees will meet again at 10 a.m. Monday in Honolulu to discuss Crabbe's conduct and likely engage in hooponopono, the Hawaiian practice of reconciliation and forgiveness, behind closed doors. Jonathan Osorio, University of Hawaii Hawaiian Studies professor, said Crabbe's move to seek clarity on the U.S. position is symbolic of a growing awareness among Hawaiians of their history -- a history, he said, stained by an illegal occupation of Hawaii by the United States dating back to the overthrow of Queen Liliuokalani in 1893. 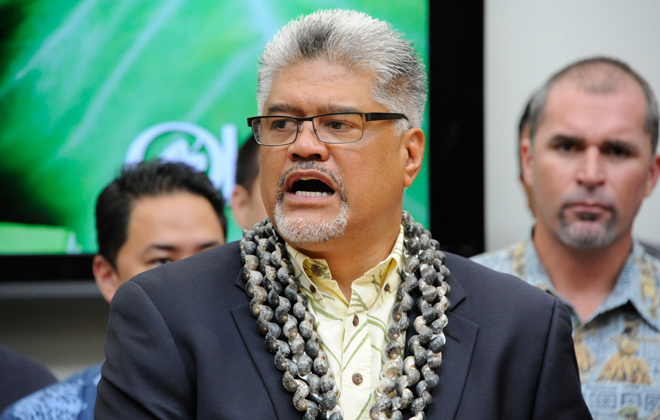 Osorio, who stood in support alongside Crabbe at his May 9 press conference, described Kana'lolowalu as a waste of time and money, an effort that won't advance the Hawaiian nation beyond that of a Native American tribe. "It makes no sense to accept the American fraud," he said. But University of Illinois law professor Francis A. Boyle, an international law expert who has encouraged Native Hawaiians to press for independence for more than 20 years, said Hawaiians don't have to bother asking Kerry about the Hawaiian Kingdom. He said the State Department already addressed the issue in 1998 when he and David Keanu Sai took their case for an independent Hawaiian Kingdom before the U.S. Supreme Court. Boyle said te court asked State Department attorneys whether the Hawaiian Kingdom is a recognized sovereign and they responded with "no," prompting the justices to throw the case out of court. "With all due respect, I don't think asking Washington, D.C., to tell you what to do is necessary. Hawaiians need to decide for themselves. Any advice they get from Washington will be biased against them," he said. Boyle, who has been asked by OHA to speak about such issues at a June conference to help prepare for the 'aha, or constitutional convention, said he believes what happens at the convention will be a valid exercise under international law, given the large number of Native Hawaiians who have signed up to participate. Kana'lolowalu enrollment closed May 1, and the final roll -- which will include thousands of names from previous similar rolls -- is expected to be certified in June. Barring any delays, those on the roll are scheduled to elect delegates to the constitutional convention in September. Delegates will convene at the 'aha in October or November, with the aim of drafting a governing document that will go back to those on the official roll in January for an up-or-down vote. Some have described Act 195, the state law that created the roll commission, as the state version of the federal Native Hawaiian Government Reorganization Act, also known as the Akaka Bill, which would create a process for Hawaiians to form their own governing entity and negotiate with federal and state governments on land use and cultural issues. U.S. Sen. Daniel Akaka first introduced the bill in 2000. But after repeated tries, he never got the Senate to approve the law before retiring a year ago. The Hawaii delegation since has pledged to take up the cause but, still lacking votes, hasn't re-introduced the legislation. Instead, they have explored other avenues for federal recognition through the Obama administration and the Department of the Interior. Many who are working for independence reject such efforts, having turned their attention to the United Nations and other international forums in hopes of resolving what they see as a prolonged occupation. A new book called "Liberate Hawaii," by Jon Olsen, argues that Hawaii can regain its sovereignty like Lithuania did when it became free of the Soviet Union after 50 years of similar annexation claims. Osorio said the questions Crabbe raises are important -- if for nothing else to allow the U.S. to respond. "These are questions that many people have been asking but we get no answers. Because officially the U.S. doesn't take notice of these questions," Osorio said. "But Kamana'o made it possible for the U.S. to actually have to take notice. And it would be a shame if the OHA trustees were to prevent that from happening. If Kerry responds with half-truths and "untruths," then "it at least opens the door for all kinds of arguments of accuracy," he said. If Kerry doesn't reply, he said, it implies culpability. VETERAN independence warrior Dennis "Bumpy" Kanahele said he too supports Crabbe. "As a high official of the state of Hawaii, someone finally had the balls to ask the hard question," he said. At the same time, Kanahele doesn't want any delays to Kana'lolowalu. "The reality is that a Hawaiian government is emerging, the Hawaiian people are uniting, wanting to learn and understand more about the overthrow and the political, economic, social, and cultural aftermath," he said. Roll Commissioner Robin Danner said she and her fellow commissioners are dedicated to completing their job and publishing the final roll this year. "My hope is that the OHA trustees and their CEO will have the resolve to complete their commitment to those that enrolled as well," Danner said in a statement. "Personally, as a Hawaiian, as a mother, a grandmother -- I don't need to go back to move forward. Hawaiian sovereignty is about moving forward, about perpetuating our culture and language, about health and housing, about focusing a native government in a government-to-government relationship with the state, the feds, and any other government in the world to advance the well-being of our people. It's not complicated." The Office of Hawaiian Affairs commits itself to serving the Native Hawaiian people by facilitating a process, in collaboration with other Native Hawaiian institutions, by which Native Hawaiians may choose to create a governing entity that comes from, consists of, and represents Native Hawaiians through an independent election that utilizes the Native Hawaiian Roll. OHA will sup- port the election of delegates by Native Hawaiians to convene a gathering of delegates at a Governance 'Aha. The Governance 'Aha would facilitate the opportunity for delegates to propose the form, scope and principles that would guide the Governing Entity, for the approval of Native Hawaiians. OHA commits to working with that Governing Entity, if created, to empower and assist it in ways that are consistent with OHA's statutory responsibilities and fiduciary obligations to its beneficiaries. Voting in the referendum to follow the completion of the Governance 'Aha. OHA strongly encourages Native Hawaiians who have not signed up for the Roll to consider doing so, in order to preserve the option of participating in one or all of these steps. To assist with these steps, once the Native Hawaiian Roll Commission announces that its work is complete and publishes the Roll, OHA will request and accept custody of the Roll. That Roll will be used as the basis for verifying eligibility to vote or run in the delegate elections, and to vote in any referendum on the Native Hawaiian governing entity's form, scope and principles. OHA will continue its current responsibilities with its Hawaiian Registry Program, consistent with applicable law. OHA will not undermine the future Governing Entity's inherent right to determine its membership criteria.